What does a Shareholder Agreement actually DO? ~ How long shareholders will continue to be paid if they become disabled. Who will buy their shares, and for how much? ~ How shares will be dealt with at death. What formula will be used for the purchase price? Will the company buy them back as a redemption, or will a person buy them from the estate? Many business owners are under the impression that if they are business partners with family members an agreement isn't necessary. This could not be further from the truth, and often becomes even more important because situations can arise where you could go from being partners with your brother one day to being forced into a partnership with your sister-in-law the next. Ultimately, shareholders have a say in the significant business decisions of the company while everyone is in the same position, healthy, and working. They are not necessary for a one-person corporation, but very valuable when there is more than one shareholder or if you are looking to bring in additional investors as you grow your business. The content and wording in your shareholder agreement is crucial. The liability, tax, succession planning and management implications are huge. It is essential to get it right. You need to consider factors such as (to name but a few) classes of shares, capital gains exemptions, insurance, and what type of "triggering events" will impact buy-sell procedures (death, bankruptcy, critical illness, and buy-outs). To assist you in creating a document that works best for your business, we have created a Buy-Sell Agreement Checklist. 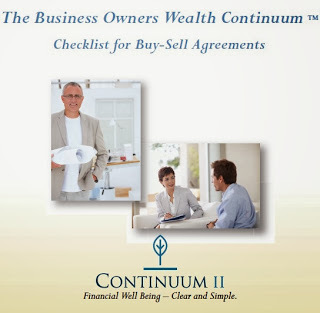 You'll find it on our website in the Continuum II Inc. Business Owner's Resources Toolbox, full of helpful templates and tools to ensure you are making informed decisions on everything related to your business.